Gavin Smith will cook a pop-up dinner at the Beach Plum Inn on August 9. As I walked around North Tabor Farm with Gavin Smith on a sunny Sunday afternoon a few weeks ago, I kept having flashbacks to my first summer on the Island 10 years ago, when I fell into the habit of stalking farmers. Let’s just say I was a little nutso at the time, and probably downright annoying, but in my defense, I was filled with wonder, having escaped my suburban/urban life for this place that truly stunned me. I kept calling everything magical, but that wasn’t hyperbole. Compared with my old world and my old life, this felt otherworldly. When I first heard Gavin say, “This place is magical,” I got goosebumps. And then I wished for a bottle and a genie to capture that feeling for him to keep. Because there is nothing like it. If you come to the Vineyard already obsessed with food, and slowly begin to discover the crazy good stuff that is grown and made here — and in such a beautiful place by such interesting people — well, you do feel a little like Charlie in the Chocolate Factory (only safer). With Gavin, you get the sense that everything that’s come before has prepared him for this moment in time. And that being on the Vineyard, starting his own business as a private chef, is a dream come true. This is a man who’s been in the restaurant business his entire life, only at the opposite end of the house: the front instead of the back. During college at Hofstra University in Long Island, he waited tables, bartended — the usual — until one day the general manager of the restaurant he was working at quit. It was just before Gavin’s graduation and a day before Mother’s Day, when the restaurant would generally do 600 covers. During the next 12 years of being a restaurant general manager, and some time spent in the wine business, working for an importer of Bordeaux, Gavin was not-so-secretly wishing he could spend more time on his real passion — cooking. Especially cooking for other people. He solved that problem by starting a Sunday Supper Club in the home he shared in Atlanta with his longtime girlfriend Angela Prout (they’re married now). The couple had moved to the southern city after Gavin’s older sister died, leaving Gavin’s brother in law with an infant son. “There was no question in my mind about moving there. My sister was 10 years older than me and had really looked after me. So this was my chance to give something back to her, to help my brother in law raise my nephew,” he said. At first the Sunday Supper Club was just a few friends. Then came friends of friends, and friends of friends of friends. He realized that it wasn’t just the cooking he liked but the whole experience of bringing people together. “It made me think about the fact that I might someday like to start a business like that,” he said. Meanwhile, the supper chef (and the supper club) got a name: The Food Minded Fellow and the Food Minded Fellowship (and of course foodmindedfellow.com). “My wife says the name is perfect for me because all I do is think about food,” Gavin admitted. Apparently, though, the classically trained violinist who has also traveled all over Asia (Nepal, India, China, Korea) thanks to his Buddhist mom, does in fact, think about one or two things other than food. Not the least being Angela — they eloped to Savannah, Ga., three and a half years ago. After a short and sweet wedding, the couple traveled to Cape Cod to celebrate with friends and family and decided to take a quick day trip to Martha’s Vineyard afterwards. Gavin wanted to show Angela the place he remembered from family vacations. They went over to the Island for the day, and have pretty much been here ever since. Angela fell in love with the Island right away, and on the day they visited, wound up walking into Benito’s Hair Styling on Circuit avenue and walking out with a job offer. The couple decided to take a cue from the universe and make a move. Gavin started his own version of the farmer-stalking routine (much more graciously than I had, I’m sure). 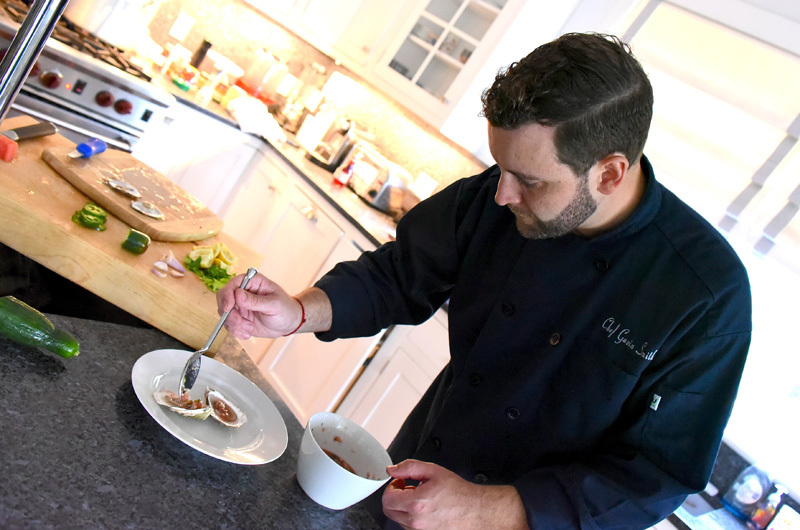 On Thanksgiving 2015, he incorporated the Food Minded Fellow into a business, with no huge plans other than to offer his services as a private chef cooking with the freshest ingredients. To meet people, he participated in the MV Wine Fest, cooking two dinners in private homes. The dinners rolled into recommendations that led to private clients for Gavin. This summer, he has twice as much business and a growing variety of events to cook at. A few days after I met Gavin at North Tabor, he was due back at the farm to cook for Farm.Field.Sea.’s second Farmer and Chef for a Day event of the summer, led by Nevette Previd, with farmers Rebecca Miller and Matthew Dix. Gavin would be brining and cooking the farm’s chickens in their wood-fired ovens as the centerpiece of a meal. The scent and flavor of those chickens carried far and wide on the farmer-chef grapevine after the first event. Cooking with fire and grilling are getting to be a specialty for Gavin — this year he won a new grill after the votes were tallied in the Burger and Bubbles completion at the MV Wine Fest. Gavin’s burger featured a topping of home-cured duck pastrami, as well as pickled red onions and kimchi mayonnaise. But finding the freshest ingredients at farm stands and fish markets is still the driving force behind his cooking. What else was on those tacos? I had to ask him. Yum. 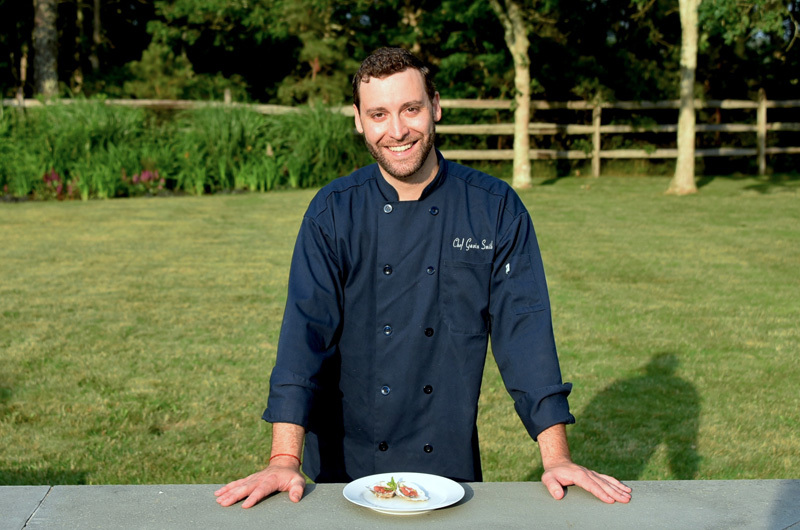 Next up, Gavin is cooking a pop-up dinner at the Beach Plum Inn on Wednesday, August 9. On the menu: watermelon gazpacho (with cucumbers, tarragon, and ceviche); shellfish stew with mussels, tomatoes and fennel; braised lamb with favas, green garbanzos and shell beans, and more. I’m thinking this must be some kind of fun for Gavin at this point. “Well I’m doing something that is still relatively new to me, to have this little business, but the sky is really the limit. And there’s always more to learn, there’s always more to do, always ways to build. I love that about cooking,” he said. 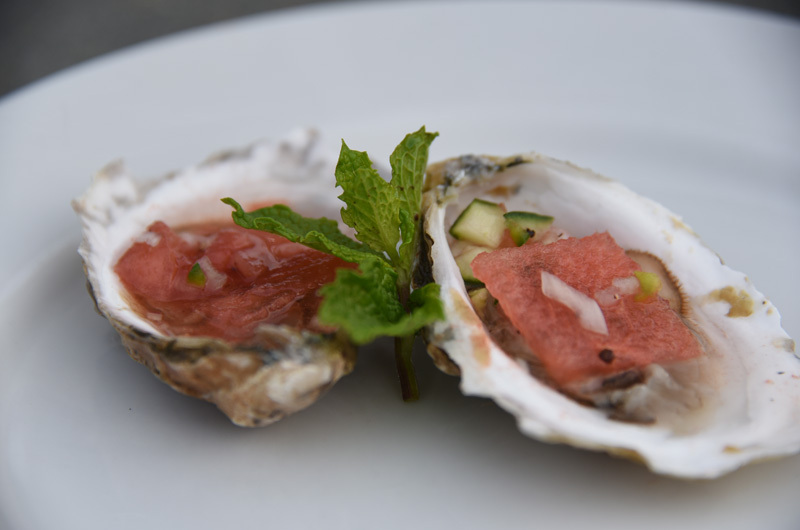 Recipe for watermelon jalapeno mignonette for oysters.